Your slow, incremental growth feels like a death sentence—but it isn't. Take it from Constant Contact CEO Gail Goodman, who said her team popped champagne when they reached their very first 100 customers. Fast forward to several months after this celebration and they still “weren't even close to paying the bills”—never mind turning a profit. It was slow going, and with the wrong mindset it could have seemed fatal. But Constant Contact believed small, slow, cumulative changes could build a successful business and they kept at it. Now the company is worth over $1 billion and serves over 5 million customers. Even though this gradual growth stage has been coined the Ramp of Death, it should really be called the Ramp of Life. If you are making progress and you persevere at this stage, your company can and will be successful. You just need to understand why and how this kind of growth can actually bring your company to life. The funding scene is tough. Investors and media laud the unicorns and the pedal-to-the-metal startups that grow aggressively. It can seem like exponential growth is the only path to success. 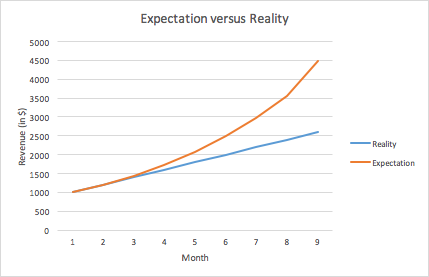 Even though in reality you are increasing revenue, your growth looks slow compared to your exponential expectations. But don't lose faith in your company or hide your real numbers. This is where the Ramp of Death can show its true value. The x is the time scale you use to benchmark growth—usually months or years. The y is your increase in revenue. The m is the slope of your line, or the constant rate at which your company is growing in revenue over time. The b is the y-intercept, or what your initial revenue is when you define your starting point. 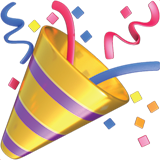 The x variable changes as time moves forward and the y variable increases as your revenue increases. If you're measuring your revenue every month, then the slope of your growth is the change in your revenue over the change in time—in other words, new net revenue per month. The y-intercept is your starting point, or your initial revenue when you start tracking your growth. Constant Contact's growth from early 2002 to late 2005 shows linear growth that forms a Ramp. The slope of this line is $31,250/month, meaning the approximate net increase in revenue each month was $31,250. The y-intercept is $100,000—the monthly recurring revenue (MRR) in early 2002. This trajectory on the Long, Slow Ramp of Death helped Constant Contact grow to their IPO point in 2007 when the monthly revenue was at $1.8 MM. Their IPO time roughly falls in line with their linear growth along the Ramp of Death. 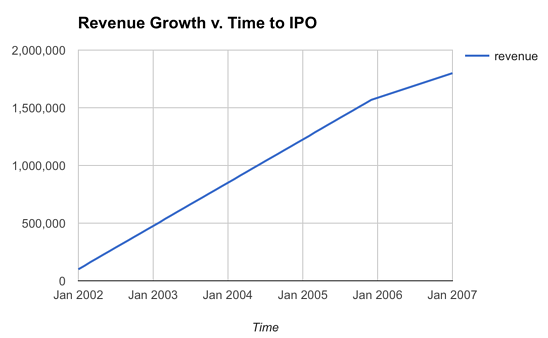 The graph shows Constant Contact's approximate linear growth from early 2002 to late 2005 with an extension to their revenue in 2007 when the company issued an IPO. Growing along the Ramp of Death trajectory helped lead Constant Contact to this important revenue goal and business benchmark. Key Takeaway: If you want y (revenue) to change, then the variables you control are the slope and the y-intercept—you can't change how fast x (time) moves. You are in control of these components of your growth. By determining their values, you can decide how fast you grow and how soon you reach your revenue goals. Your y-intercept tells you exactly where to start tracking your growth as a real, viable company. The time when you define your 0th year is somewhat arbitrary. It doesn't have to be Day 1. Even though Constant Contact began in October of 2000, Goodman chose to define the beginning of their linear growth in early 2002 because that's when the company had passed its critical mass. Know where and when this point is, but don't obsess over how high it is. Instead, find your starting point and then plan for long-term growth from that point. Make decisions that you can live with several years down the line, and create a culture that encourages employees to invest in the long haul. You'll start tracking your business's growth in the 0th year, or when you reach what Jason Lemkin calls initial traction. This is the time when you consider your company to be a viable business. It can vary and may correspond with a milestone, such as $1MM Annual Recurring Revenue. 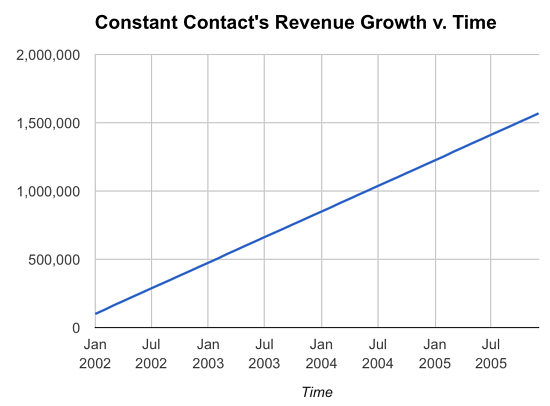 Constant Contact had reached $1MM ARR at their time 0 on the graph above ($100,000 MRR x 12 > $1MM). 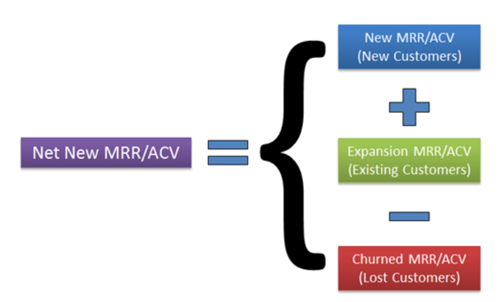 Starting at a lower y-intercept (a lower MRR) won't prevent growth—your milestones may just be delayed. The lines below represent companies that are all growing at the same rate, but had different initial MRRs—y-intercepts—as their starting points. The company represented by the blue line can grow to $3,000/month by month 3. The company represented by the orange line will get to $3,000/month by month 2 because it started at a greater y-intercept value. Key Takeaway: Don't jump the gun and start tracking too early. Wait until you reach initial traction and have a real, small-but-growing SaaS company. You'll be tiny but the key is you'll also be sustainable. Once you have a company that compounds you can really plan for continued strategic growth. The slope tells you everything you need to know about how much you grow over time. A flatter slope and a low rate of growth has a compounding negative impact on the time it takes you to reach revenue goals. New net MRR can change in response to changes in any of these contributors. It can get harder to maintain a constant slope as you grow because some contributing factors may scale while others may not. For instance, your churn rate might remain the same as you grow, but your acquisition rate might decrease over time as you saturate your initial channels and markets. 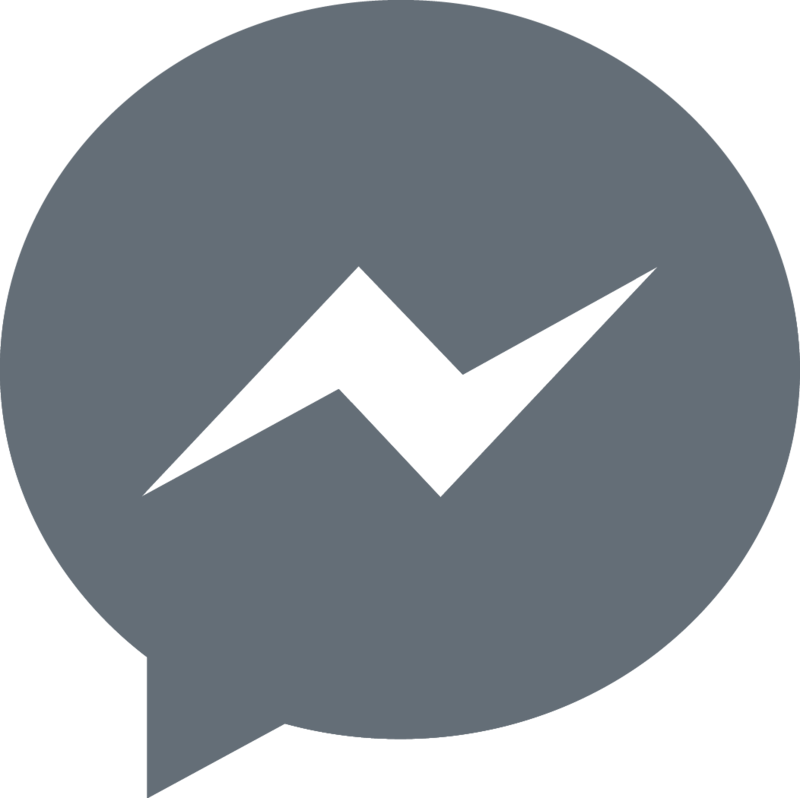 Acquire new customers that are aligned with your pricing plans, increasing new MRR. Retain current customers by providing the value they were promised in their initial plan. Upgrade existing customers along your value metric, optimizing MRR from these existing customers. Minimize the lost MRR from churning customers by figuring out why customers are churning and remaining vigilant about responding to customer feedback. Focus on keeping those customers and use retention as a strong pillar for growth. Embracing the Ramp for MRR growth means being comfortable with a decline in another popular growth metric: month-over-month (MoM) growth. MoM is calculated by the net increase in revenue per month divided by the previous month's revenue. This simplified but extreme case's data shows the net revenue growth has a slope of $1,000/month. But as the bottom line gets bigger and the monthly additional revenue stays the same, MoM growth decreases. Companies are often skeptical of linear growth because it corresponds with MoM decline. In this example MoM drops from 100% to 50% to 33% and continues to shrink even though MRR is increasing by $1,000 each month. The higher your slope, the more quickly you'll reach revenue goals. 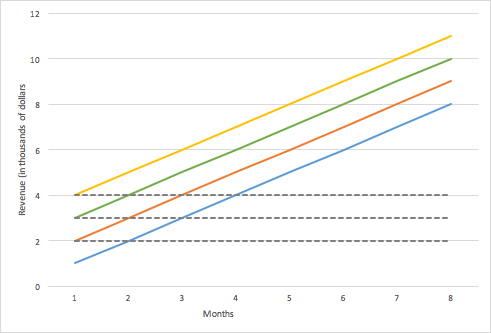 The three lines in the graph below represent different companies that started with the same initial value but are growing at different rates (with different slopes). The company represented by the yellow line was able to reach $16,000 at month 8 with a growth slope of $2,000/month. The company represented by the grey line barely reached $4,000 at month 8 with a growth slope of about $286/month. And as the graph shows, the consequences of different slopes only compound over time. 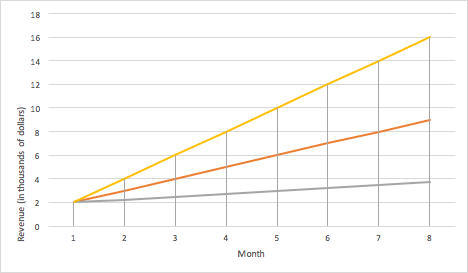 The yellow-line company has only surpassed the grey-line company by less than $2,000 in MRR by month 2, but surpasses them by over $12,000 by month 8. Key Takeaway: To maintain a high slope of growth you have to think and act dynamically. Focus on monetization and retention as pillars for growth as you scale. Constantly reassess your pricing strategy to make sure you are getting the most out of your plan at every stage of your growth. You should also continually evaluate why customers are churning and then flip your strategy around to make sure you retain the most customers. The Long, Slow Ramp of Death is really your small SaaS company's Ramp of Life. If you're growing this way, you're surely and steadily pushing your company towards success. But you have to be patient and unrelenting. If you want to reach IPO on the Long, Slow Ramp of Death, you have to be willing to put in the time of 7-10 years. If you know that customers find value in your product and you are seeing growth, stay on the ramp and persevere. P.S. To help you set goals, and keep track of your growth, we created a free software called ProfitWell. Check it out!